How many of you use Internet Explorer to surf the web? Don't lie to me because I know. I have Google Analytics on the case checking you all out. I know that 20% of you (not including mobile visitors) are using IE to visit this site. OK, how many of you are using IE 7 or lower? 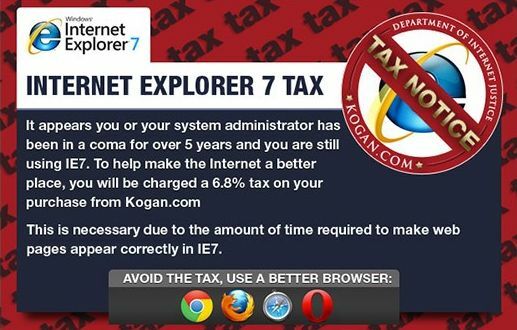 You, the 7.19% of the Internet Explorers are causing big headaches for web designers, according to Australian electronics retailer Kogan.com. "Internet Explorer 7 has long since passed its use-by date," said Ruslan Kogan, the company's founder and CEO. "It's a constant source of frustration for our web guys and we're sick of burning cash on a browser that hit the market nearly six years ago. … It's not only costing us a huge amount, it's affecting any business with an online presence, and costing the internet economy millions of dollars." Kogan.com also plan to increase the penalty tax by 0.1% increments every month in order to switch people into modernising their browing. "As Internet citizens, we all have a responsibility to make the Internet a better place," said Kogan. 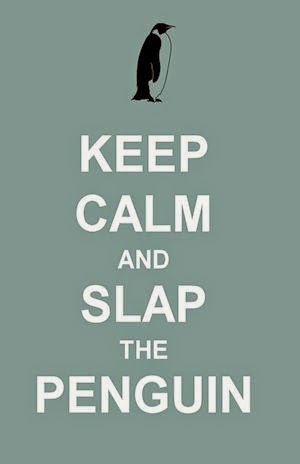 "By taking these measures, we are doing our bit. We'll also be able to increase our efficiency, help keep prices for all smart shoppers down, and hopefully help eradicate the world of the pain in the rear that is IE7." If amazon.com pulled a stunt like this, would you upgrade your browser, or would you spend your e-cash elsewhere? Use the comments and let the world know. Blogger (part of google) is no longer supporting IE7 either. The pages show up but some functionality is unsupported.